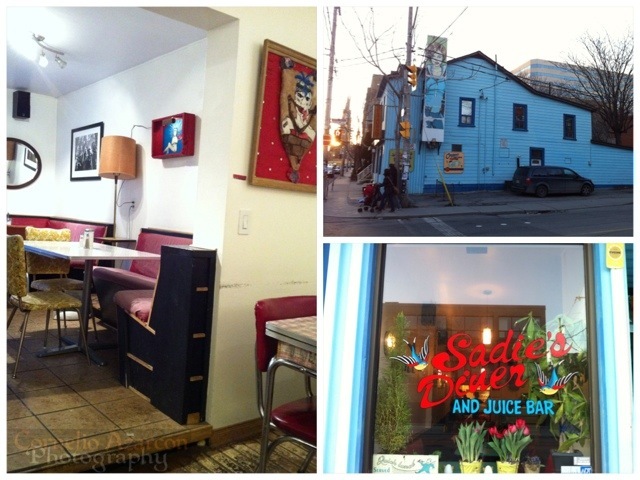 One of my friends, an Ovo-Lacto Vegetarian has suggested that I check out Sadie’s Diner & Juice Bar in the Queen West neighbourhood of Toronto, and it specializes in Vegan/Vegetarian cuisine. We also thought that it would at least be an interesting subject for my blog. So last night, 3 of my friends and I drove to Toronto after work for this vegetarian adventure. The restaurant looks like a house on the outside, and is painted blue, and is located at a street corner. 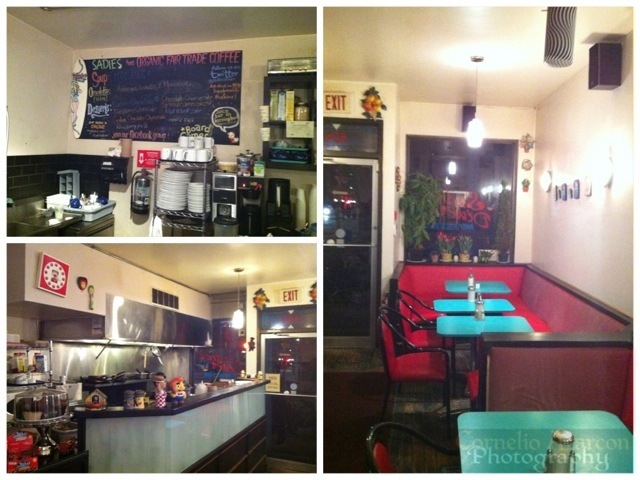 The interior is set up diner style, with limited seating at the front, with more seating at the back. The table and chair setting look like old, a little worn down 1950s diner tables along with chairs that are equally worn down. There are also 2 wall shelves behind glass panes that display a varied collection of PEZ dispensers. 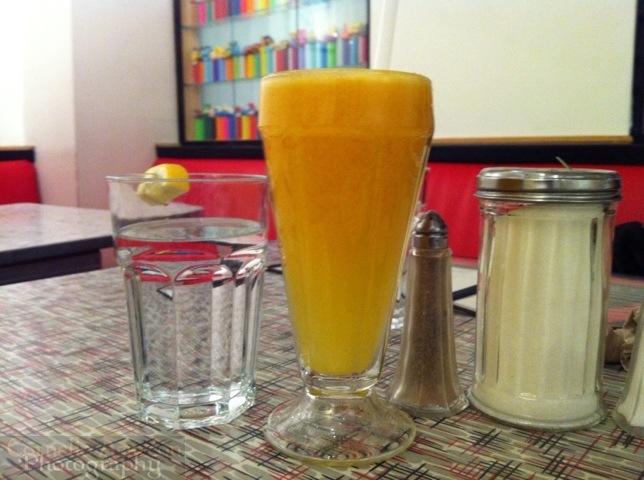 I ordered a glass of freshly squeezed orange juice ($4.00) to drink. It had the right balance of sourness and sweetness to it. I ordered a few things from the menu, first of which was a side serving of Vegan Bacon ($2.50). I apologize if I offend anybody with what I’m about to say, but if you’re vegan/vegetarian, why would you want to eat something that resembles or even tries to replicate the flavour of meat? 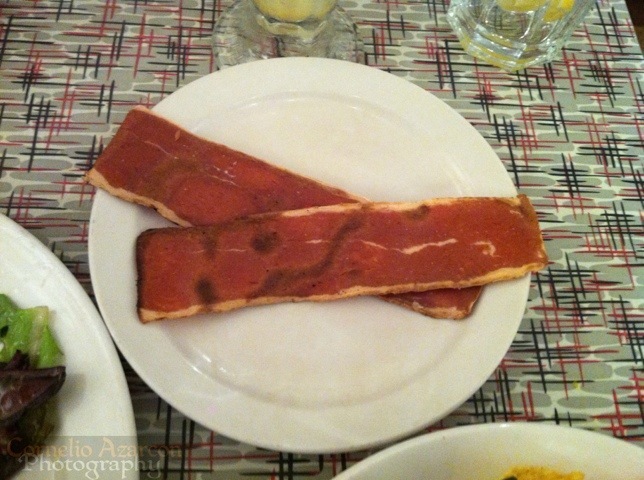 The vegan bacon tasted like simulated bacon bits, but in strip form, and looked like Beggin’ Strips. Not really a picture I wanted to have in my mind when eating bacon…the image of eating dog treats. 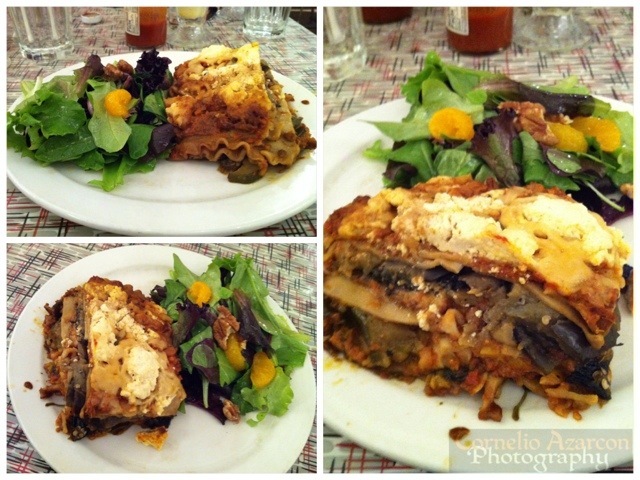 My second order was a plate of Lasagna ($10.00), which came with a side salad. The salad was an assortment of mixed greens topped with mandarin oranges and pecans with light vinaigrette dressing. The presentation of the lasagna didn’t look all that appetizing, with the top half almost sliding off the bottom half, and also lacked an assortment of colour. Nevertheless, I gave the dish a try, and it tasted great! It was whole-wheat pasta with grilled vegetables, mozzarella and ricotta cheeses, with tomato sauce. I haven’t had vegetarian lasagna before, and I thought this was a pretty decent meal. For my third dish, I wanted to try the Chili Sin Carne ($7.00) topped with cheddar cheese and served with corn chips. 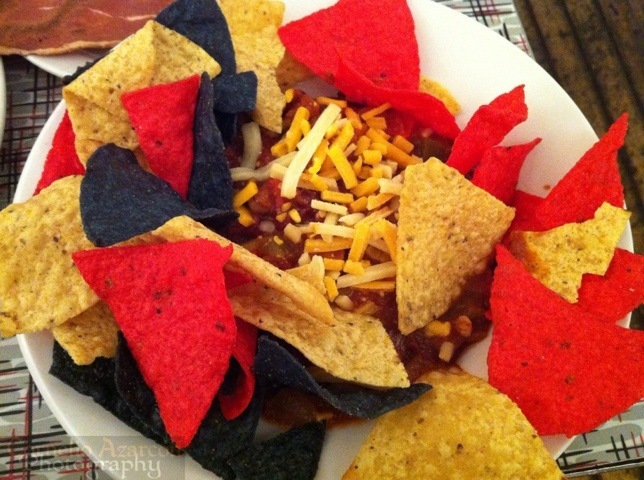 The presentation was great, with the vibrant assortment of colours of the corn chips situated around the bowl of chili. The chili tasted like salsa and beans, which, if you come to think of it, is what meatless chili basically is. The chili had a slight kick to it and went very well with the corn chips. 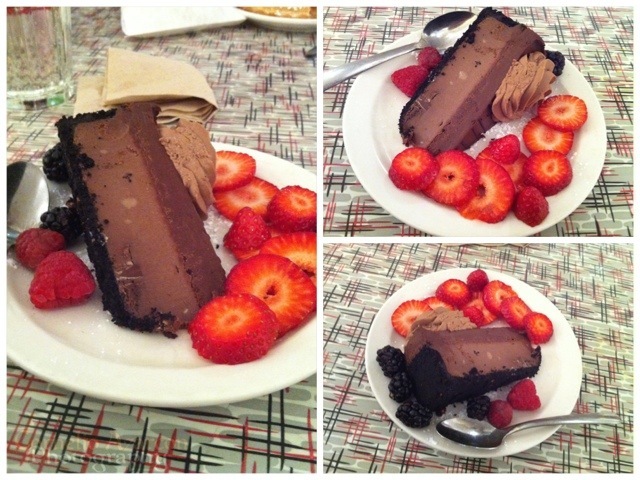 For dessert, I ordered the Double Chocolate Cheesecake ($6.00), served with fresh fruit slices. It was very decadent, and was not too sweet. Overall, it was an interesting and fun experience, and I gained a better understanding of vegan/vegetarian food. A selection of items in the menu allows you to choose between a vegetarian and vegan option. For example, one can opt for the vegan cheese instead of cheddar. However, the service was very slow and there weren’t too many patrons. My friend told me that the service is usually quick, but I guess I’ll have to come back sometime to see for myself. I’ll just have to stay away from the simulated meats. All I can say in reply to your question about why would vegetarians want to eat something that tastes like meat is that I know literally hundreds of vegetarians and not a single one of them gave up meat because they didn’t like the taste.